If it’s easy to drool and be messy and still love the food in front of you, it’s got to be a BURGER. A perfect juicy patty sandwiched between two soft buns with a delightful filling of coleslaw and mayo, sweet and sour at the same time, served with a side of chips. And yes that is how exactly we imagine a burger, one to be eaten with both hands and filling at the end of the meal. So you can imagine the excitement when we got the notification for the “Global Burger Fest” and “Cheesecake Festival”. The menu was a bit limited, but the given options was worthy in the simple yet elegant menu. And yes “Tokyo Ramen Burger” already a craze taken from the Japan’s avenues and considered the next food creation fad to the world did feature in the menu. Last heard and seen in the Woodside Café in Mumbai’s famous burger fest, this was a welcome change to be featured here in Hyderabad’s menu. 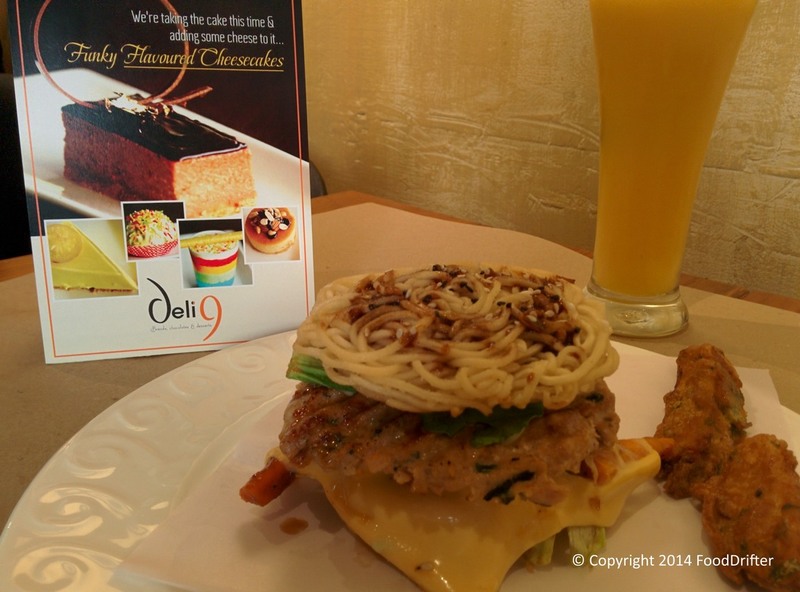 So we dropped in at Deli 9 for our evening snack & to catch a quick bite of the Burger fest. The Tokyo Ramen Burger is one enticing dish featured prominently and we could see few tables ordering it as well. Without wasting much time, we ordered two burgers off the menu. Tokyo Ramen Burger – A juicy patty of chicken packed between two crunchy pan fried noodles had all the good things going for it. The pan fried noodles was a bit dry and little more crispy than expected but with the parts where the sauce soaked in, it just went right through, opening up a wonderful world of tasteful explorations that we relished. The wasabi Mayo hit the right notes and got us craving for more with every bite. Big Bash BBQ Chicken Burger – A big chunk of meat with the caramelized smoky onions and pickles all culminating in the right concoction of sweetness and sourness, this was exquisite. It is good at times to get your hands dirty while biting into a whole burger at once and the juices oozing out while you sink in your teeth. Chocolate Burger – An interesting take on the burgers here at Burger Fest was the Chocolate Burger. Gooey Brownies packed with hazelnuts, Oreo, topping it off with that enticing caramelized plum and a look at it and you know it’s going to be a delight in every bite. After the first round, we can’t wait to get our twitchy hands on that Towering Burger which we have reserved for the next trip back to Burger Fest. Dollops of Nutella glistening through the glass and the other Cheesecakes on display were extremely tempting. Red Velvet, Lemon Set Cheesecake, Rainbows and Oreos Cheesecake and can’t wait to try them all. A welcome difference from the regular eating-out here in Hyderabad and the fest is an extremely worth every bite. Both the Global Burger Fest and Cheesecake Fest are on till the end of the month of September at Deli 9 at both their Banjara Hills and Begumpet outlets.